Because of the Steam Summer Sale, the great economic Satan that it is, I finally played through Portal 2. Like everyone else on the planet, I enjoyed it, and I think that there are a number of things that still remain to be said about the game a full year+ after its release. With that in mind, here are five things that I thought about Portal 2. 1. The gender politics of Portal 2 are deep and difficult to parse. So, when Glados assaults Chell using “female” insults, sliding into a mode of behavior often cruelly stereotyped as “female”, the audience isn’t made to accept these things– instead, we laugh at them. We know that Chell is above them. We know that Glados, as a robot, is only saying these things because she believes that this is how humans think. But it isn’t how Chell thinks! Chell, the real woman here, would never behave that way. Because we’re made the harassed target of these gender-focused insults, we see, first-hand, how stupid they are. We maintain our dignity, and Chell continues to be a female protagonist we can respect– mostly because she’s a shell, incapable of participating in the guts of the argument. Her personality is our agency. We know she’s not stupid, or fat, or even bothered by the insults, because we’re not! I didn’t have this same reaction. Chell being silent was, for me, indicative of an entire bullying culture. Glados, a powerful figure, had already trapped Chell into a system of infinite testing. This was the logical next step–trap her mind in a small operating space. It is the logic of the bully, physically and mentally breaking down the weaker being. And so instead of reading Chell, and myself, as powerful, I instead felt a profound empathy for people who are bullied. There is also the additional, vaguely misogynistic, undertone surrounding Caroline. 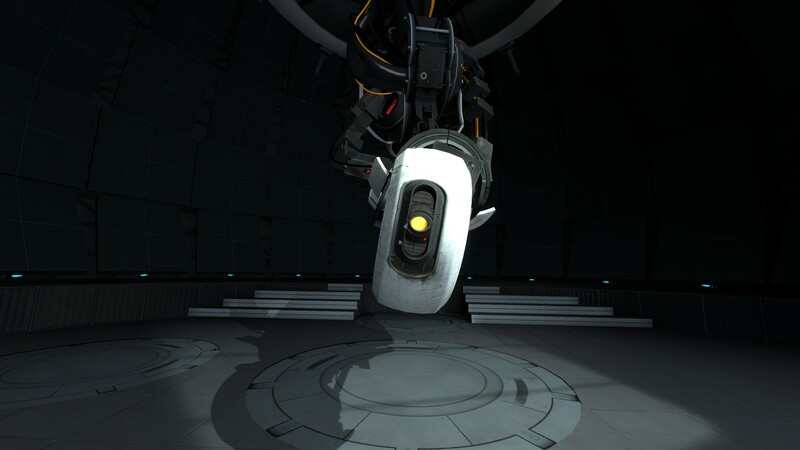 On an audio recording we hear her make several “ditzy” mistakes, and in one instance it is followed by Cave Johnson saying “Poor girl.” It is this woman who is the soul of Glados, transferred into a digital existence, and only after she is deleted is Glados able to understand that she has to force Chell to leave in order for life to go on. In a very literal sense, the only way that Glados can break out of her bullying cycle is to “kill” the actual woman inside of her. By becoming a pure machine she is able to see the “correct” pathway, which is simply removing the Chell factor from her testing altogether. 2. I thought Portal 2 was too easy. There was only one puzzle that took more than a couple minutes for me to figure out, and even it wasn’t so much difficult as it was obscure in design. I had the same issue with the first Portal–for me, the puzzles end up being more about the mechanical process of having to perform the answer than actually figuring it out. I don’t have to “puzzle” them; I solve them and have to show my work. I’m not sure that is good design. RY: I don’t think – well, first of all, there’s that HUD indicator that shows where your portal is at all times. RY: … Especially the underground part, where you’re looking for just that little bit of white wall. DP: It ended up being weirdly less creative in that regard, like an FPS where there’s literally only one target and one bullet. [contemplative silence] It would be interesting to have an identical second room, that isn’t the first room – it’s always kind of my thing, to take the player in one direction but make it something else. This is how I felt. There is an equation, and I have to solve for x, but the problem isn’t nearly difficult enough to make that solving a fun process. 3. The writing is superb. The developing drama between Wheatley and Glados was amazing. They both had flaws and fears, and the use of Chell as a force that is leveled against each of them is pretty genius–she has no allegiances, no home team, and so she is able to in opposition constantly, never stopping to think through Team Chell and what it means to violently react against the status quo all the time. Chell’s silence is actually one of the more brilliant moves on the part of the writers and designers of the game. Because she has no voice of her own, the other actors in the game are able to inscribe desires on her, and therefore the player, with relative ease. When Glados taunts Chell with her ability to go the surface any time she wants, the player experiences anger and jealousy, even though there is no textual evidence that Chell-as-character wants to do anything more than test in the same chamber over and over and over again. The game is literally overcoding the desires of the player without the player ever noticing, incepting a desire to live and to escape that would ring false coming from the mouth of any pre-written character. 4. The depth of Aperture Science is beautiful. By this, I mean two things–the literal depth and the historical depth. The Aperture Science labs go down for miles, and in the course of the game we get to experience the labs at a significant depth. I especially enjoyed the large spheres that the player sees at the very bottom. Huge and made of metal, they house any number of experiments that the player is never privy to. They are giant question marks, but they also create an archaeology of Aperture Science that I find incredibly satisfying. 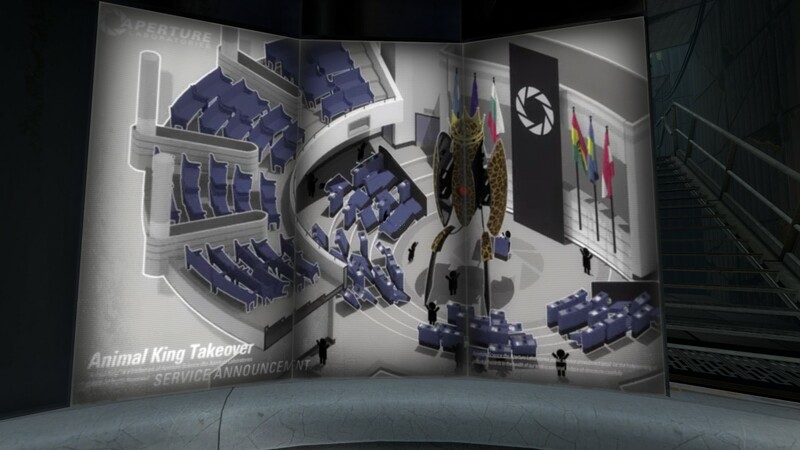 Their appearance is functionally similar to the testing chambers that Glados uses to create new tests for the player to solve, meaning that the ethic of the testing chamber has never changed in Aperture’s history. The technology and the methods have merely gotten better. 5. The game presents us with a wildly de-anthropocentric world. Watch the final cinematic again. While there is obvious pandering to the human subject in the actual events that we see onscreen (the lyrics are about telling Chell goodbye, for instance), it also shows us a world that does not need humans or human intervention to work perfectly. As Glados explains, the only way to create a harmonious world in the Aperture Labs is to eject the human and allow the nonhuman actors to test, be tested, and live lives outside and obscured from humanity. As Ian Bogost writes in his Alien Phenomenology, “Meanwhile is a powerful ontographic tool.” The robotic world of Portal 2 is infinitely large, much bigger than the player can see or experience, and it all goes on without human interaction of human dependence. Accordingly, it can do so without the player–in a strange way, it goes on right now, loading levels and testing all on its own out in a fiction that I can’t touch or feel or see. This entry was posted in Video Games and tagged object-oriented ontology, portal 2, robert yang, video games. Bookmark the permalink. I found the two different theories as to why Chell is silent to be interesting. Glados’ bullying of Chell is obvious; it is what we believe Chell’s reaction to be that is the topic of discussion. I enjoyed Michet’s opinion, as well as your own reaction. I think it kind of goes along with what you talk about later in the post, about how Chell is literally nothing more than a “shell” of a person that allows the player of the game to experience all of the emotions meant for Chell. The two contrasting ideas of what Chell might be feeling are just proof that the game is exceptionally well written; the fact that two people can feel differently about a part of the game, yet not be wrong about it, is pretty cool.